All Photos courtesy of Kevin Mellalieu, Jimi Thomson/Two Tyred Tours, Riccardo Green & Sir Guy Litespeed. Click on any of the images to view fullscreen and then use your back button to return to the text. The Cottian Alps: a remote, high range of mountains on the border between France and Italy. When the Tour de France or the Giro d’Italia wants to throw in something really high, remote and maybe even gravel, this is where it goes. Epic: a word used too often nowadays, but in the case of the Cottian Alps, it’s genuinely warranted. A squiggly line from Torino to Monaco, some 700km long and 18,000m high. Five days only, mid-June 2016. Kev Mellalieu: 50 something, a seasoned mountain man and RAPID descender; Riccardo Green: 30 something, another seasoned mountain man and loooong day climbing specialist; Allan Greenfield: 50 something, more used to the desert flat-lands of Dubai, but a Kiwi by origin and hence loves the mountains; Tom Townsend: 16, rookie-blade, new to the mountains and multi-stage riding; Emma Wood: 18, another rookie-blade, also new to multi-stage riding and mountains; and Me, Sir Guy Litespeed. I knew that there was a problem, as soon as I saw Michael’s name on the incoming call screen: he was buried at work, advising on an imminent multi-billion dollar deal and had no choice but to pull out of our trip. I could hear the regret and anguish in his voice: “Gutted.” Silence. There was a silver lining though: his employer was picking up his costs, so if I could find someone to step in, there was a free place on offer. I quickly ran through names in my mind: who might be physically ready for a trip like this, with just one week’s notice AND free to come along? Impossible. Fair enough. I nearly gave up. Then I thought of Emma. Emma lives nearby and rides for High Wycombe Cycling Club, (HWCC) – I first met her last summer and like my son Tom, she was just getting into cycling. Fast forward a year and Tom and I had ridden with her enough to know that she was strong, fast and a very smiley, ‘can do’ personality. I also knew she was probably free, having just finished exams. I sent her a note. I gave her the briefest of outlines and suggested I pop over and talk to her and her parents, after which, she could either say yes, or no. Her following five days were a blur of booking flights, arranging insurance, buying and borrowing various bits of kit, bike packing and nail biting! To say that Emma (and Tom for that matter), were ‘in at the deep end’ would be a massive understatement. Over the years however, I’ve formed a view that people with the right physical conditioning can achieve things far beyond what they and others might imagine possible. But, only if they really commit and ‘put themselves in the path of the challenge’. Our ‘Cottian Alps Espoirs’ were about to test that theory to the max. I’d realised in the last 12 months with HWCC just how little I knew about so many aspects of cycling: time-trialling, race licences, chain-gangs, crit races. It was all new. However, the one thing I did know a lot about was multi-stage mountain riding and particularly, after Lucy’s Cent Cols in Autumn 2015, I knew how to prepare and nurture ‘multi-stage mountain newbies’. The decision to take Tom and then Emma, to the Cottian Alps, was therefore an educated judgment call, rather than recklessness (or so I tried to convince myself)! 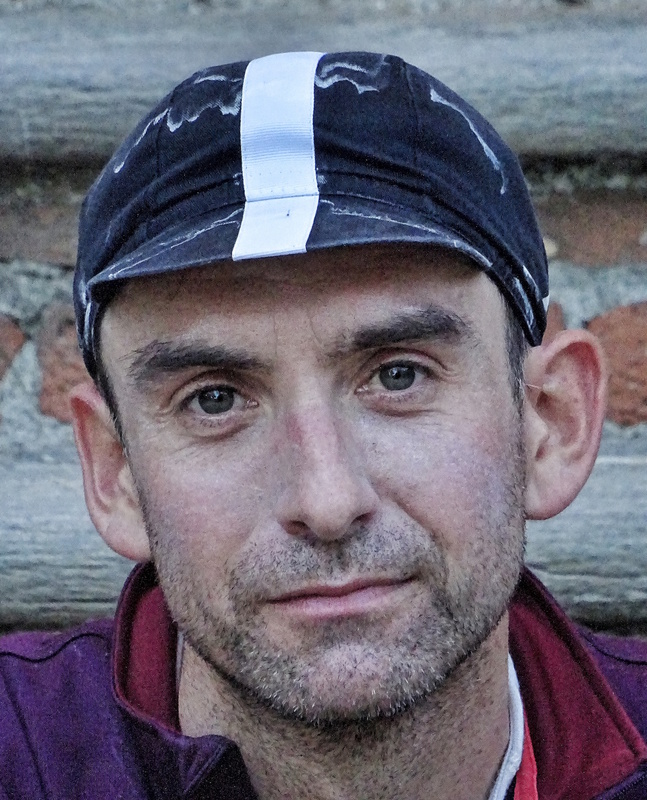 They would be surrounded by four very experienced riders and supported by one of the very best guys in the bespoke bike tours world: Jimi Thomson of Swiss based Two Tyred Tours. Together, I felt we could shepherd our Espoirs* through the mountains and mitigate most of the risks. * Espoirs is a French word, used in cycling to describe young, up and coming riders. The literal translation is something like ‘future hopes’. Just three kilometers up the very first climb, Emma announced, with a mixed tone of awe and nervousness, that this was already her biggest ever climb. She had 300m vertical showing on her Garmin. I smiled to myself and winked at Rich, beside me. Tom meanwhile was channeling his nerves straight into his legs and marking Rich attentively, keen to make sure that he was on the pace! We were climbing the early slopes of the Finestre. Unknown in cycling circles until it’s inclusion in the 2005 Giro d’Italia, the Finestre was the catalyst for the entire trip. I’d spent the last 11 years dreaming about this 17km, 1,700m climb. 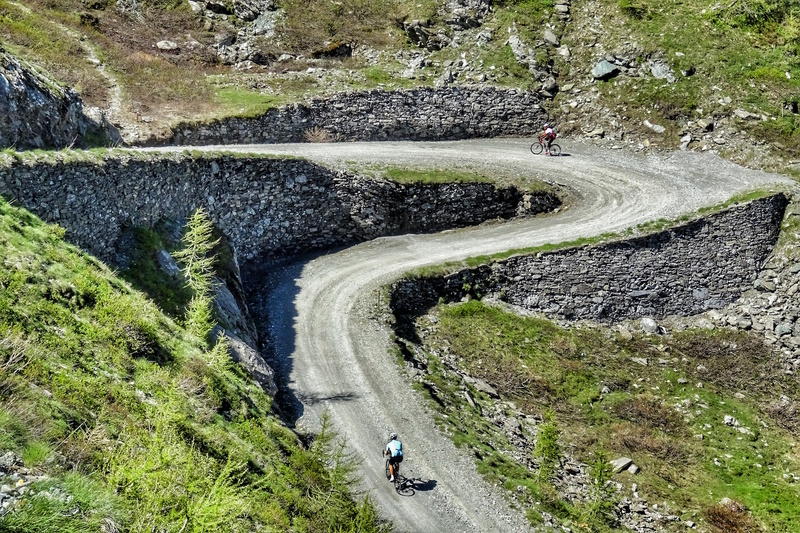 What makes the Finestre so special is the last 7km, because the surface becomes gravel. At least, on race day it looks like gravel, because the road is groomed and flattened slightly. In a non-Giro appearance year, it’s just a regular mountain track and gravel would be too kind. It’s stones, mud and rocks, with occasional smooth sections of gravel in between! The Finestre: smooth it is not! I spend my winters pouring over maps and dreaming of roads and climbs I’ve yet to visit. Once I have an outline plan, I send it to Jimi and he works on turning it into a proper route, with overnight stops. Together, we then sense check our daily distance and climbing, tweak the route if it looks too easy, or too hard and then I invite likely accomplices, resulting in a totally bespoke trip for five or six riders. This trip, from Torino to Monaco, was effectively five dreams, joined up to create an amazing point-to-point, five day road trip. To say I was excited, heading up the Finestre, was an understatement. The road section of the Finestre was steep – consistently 10 – 15%, for 10km. If it hadn’t been for fresh legs, I think we’d have found this really hard, but as it was, we coped pretty well, all arriving at the gravel section within a minute or two of each other. Running point were Tom and Rich, with Kev and I a few minutes back, distracted by too many photo opportunities and using Emma and Allan as our cycling models. 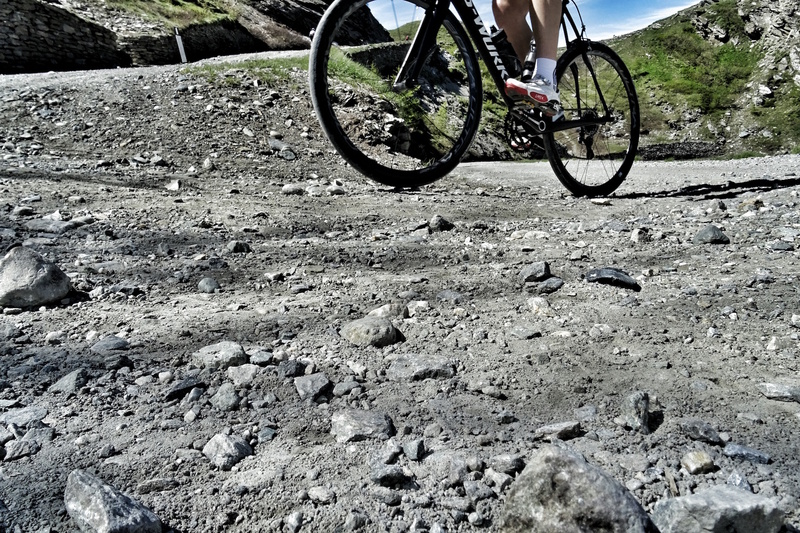 The ‘gravel’ section was consistently 8 – 10% and required complete concentration and plenty of power. Picking the right line was crucial and you had to move all over the track, constantly. We were lucky to have it dry – the weather in the Alps so far this Spring had been awful and it had rained relentlessly for the last six weeks or so. As ‘first ever climb’ this will take some beating: Emma turns the final corner before the summit. But on this day, the sun shone, our tyres threw up nothing worse than dust and we all cleaned the climb, sans punctures. It’s amazing what a road bike can do if you let it. Paris-Roubaix, Flanders, Tro Blo Leon, the Finestre. Kev & Emma on the very last ramp of the stunning Finestre. The next lesson for our Espoirs was descending. It’s virtually impossible to replicate a big Alpine descent in the UK, so this really was back to basics. With some super-fast descenders (Allan, Kev, Rich) to guide them, Emma and Tom started to learn how to do it. Going fast is easy, but going fast, safely, through corners is another thing altogether: sudden breaks in the road surface, gravel, cambers, blind bends, traffic, stray animals, rocks. My biggest fear for our learners was a downhill crash and I kept impressing 100% concentration on them. Safely down in the valley, it was now properly hot – 30 degrees C and rising. We stopped for our first proper (Italian) espresso of the trip and Kev and Rich decided to break off for one of Jimi’s ‘extras’: an optional out and back climb, or loop, for anyone who wanted to test their legs yet further! 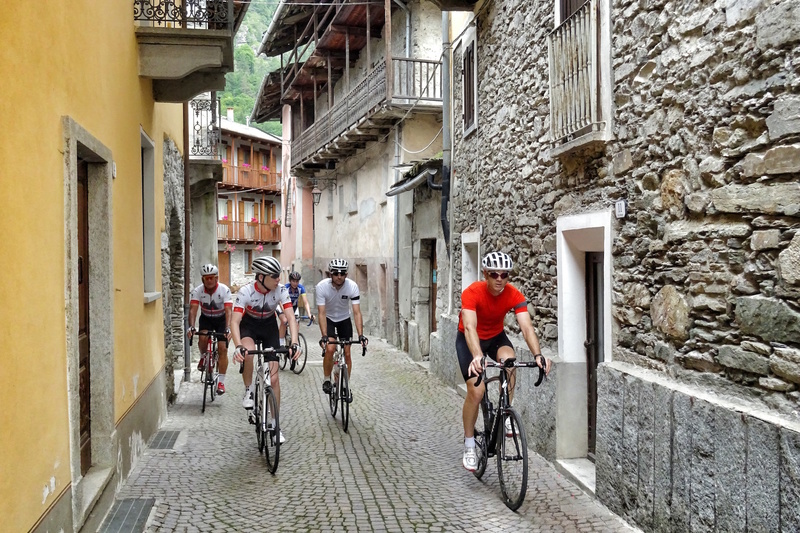 Allan, Tom, Emma and I continued on to Pinerolo and from there to our finish town of Saluzzo, via a couple of short but punchy climbs in temperatures now nudging the mid 30s. Fittingly, our final km to the hotel involved impossibly narrow streets, cobbles and a 30% ramp! Kev and Rich rolled in an hour or so later, looking like they’d been ‘tested’ by the heat! For Emma, this was her longest ever ride. Tomorrow’s stage would be harder still. Don’t try this at home: 175km and 5,000m in 35 degree heat: Riccardo thinks Stage One was a nice opener! My second dream was the Agnello. Every picture I’d ever seen of this climb had snow in it! Three words seemed to sum it up: long, high and beautiful. A 60km climb, to 2,744m. It would be the longest continuous section of uphill that I’d ever ridden. Admittedly, the first 40km were pretty gentle, but the final 20km and in particular the last 10km, really made up for it. With my Garmin consistently showing 10 – 15%, this final section, heading up into the snows, was genuinely challenging. About 30km into the 60km climb that is the Agnello. Tom had asked me a few months earlier whether you could actually feel the altitude on the highest passes and I’d said “no, not really.” But I had been wrong and with five kilometers still to go, I rode up alongside him to tell him “yes, you can categorically feel it”! The Agnello: a very big mountain! Spot Allan, a small spec, surrounded by grandeur. The Agnello, particularly from the Italian side, should be on every cyclists ‘To Do List’. It is simply, epic. Emma, followed by Tom, heading into thin air. Finally, after 60km of up, we reach the summit! From L to R: SGL, Emma, Allan & Tom. 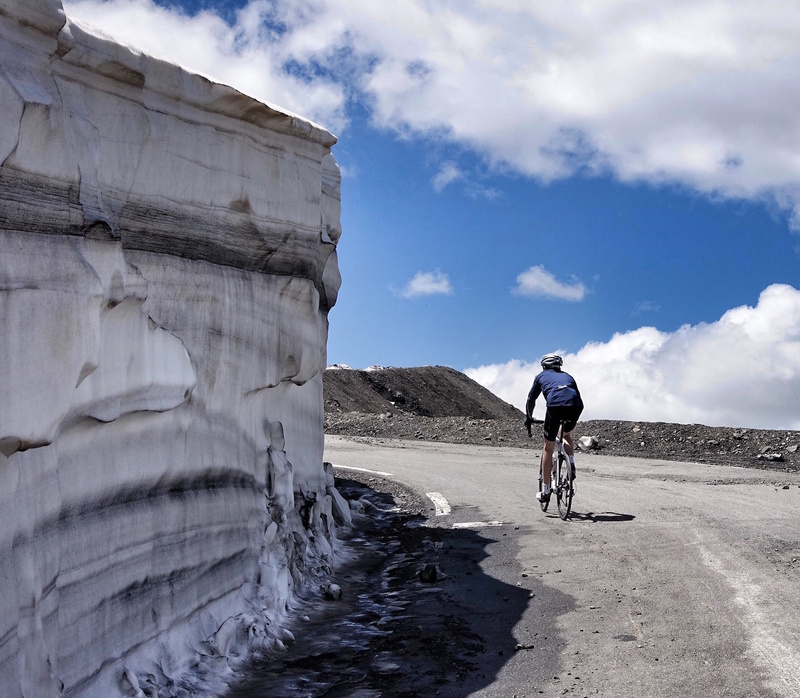 Heading down the Agnello: a Giro d’Italia was lost in one of those snow drifts, just a few days earlier! The French side of the Agnello. 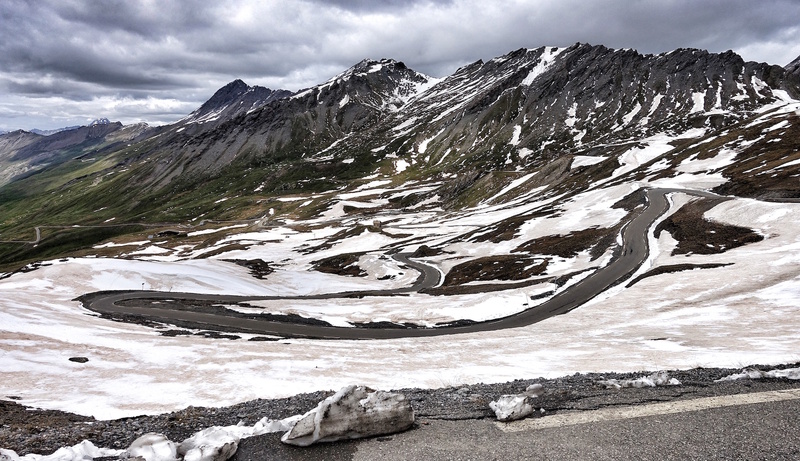 The Italian side is probably the better climb, but this side is similarly stunning. HWCC Espoirs, learning the art of going down: quickly. 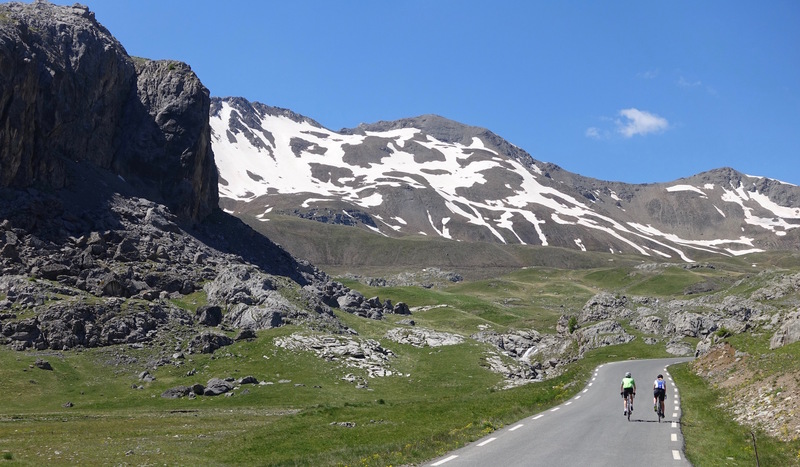 Next up was the Col du Vars, another HC climb: 21km long and very hot, with temperatures back into the mid 30s. Emma, who had started the day feeling a little creaky, discovered that it was possible to recover as the day went on and with about 10km to go, she made a break for the summit. Jimi drove up alongside Tom and I with a raised eyebrow and a “she’s gone” comment. A Coke a few kms below the summit had a similar effect on Tom and I took a stunning shot of him nearing the col in the early evening sunshine. Tom nears the summit of the Vars. The following 30 minutes will stay with me forever. 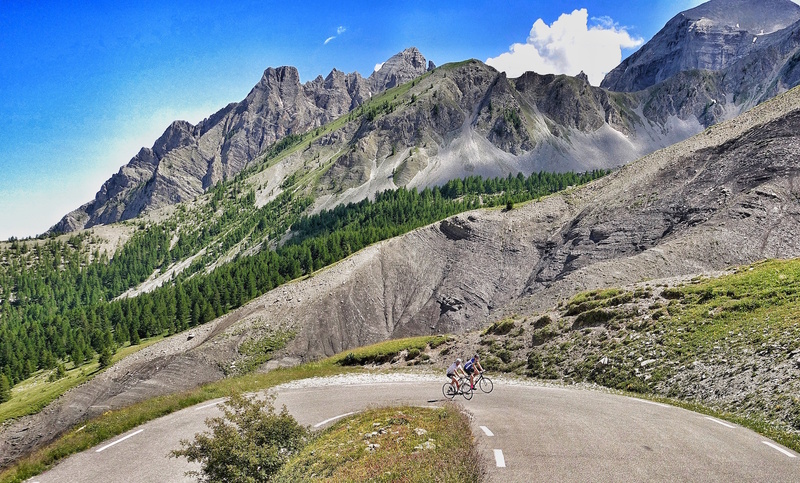 In just 24 hours, Tom and Emma had worked out how to descend a mountain fast and I found myself grinning from ear to ear, as we flew down the final 20km to Barcelonette, with the Espoirs cornering like pros. 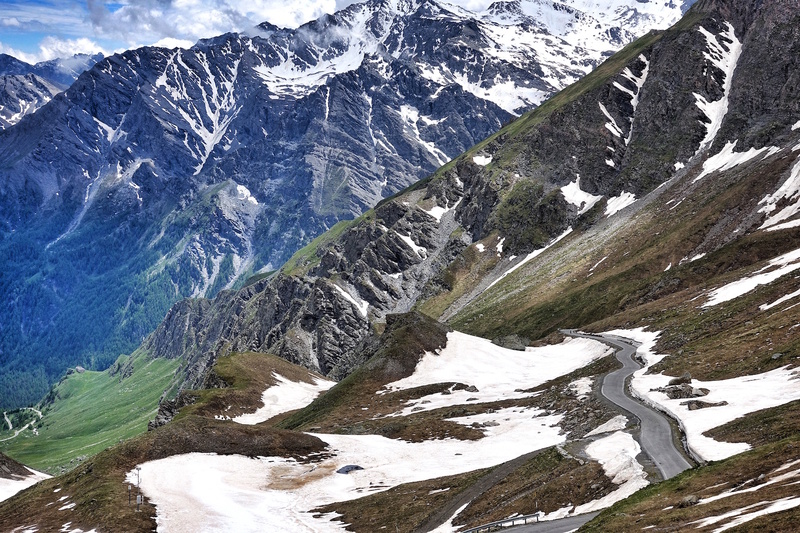 The descent off the southern side of the Vars is worth seeking out – it’s superb! Meanwhile, behind, Kev and Rich caught Allan and the three of them shared the same descent and arrived at the hotel just a few minutes behind us. Dream #3 was something I’d read about in Daniel Friebe’s book, Mountain Higher. 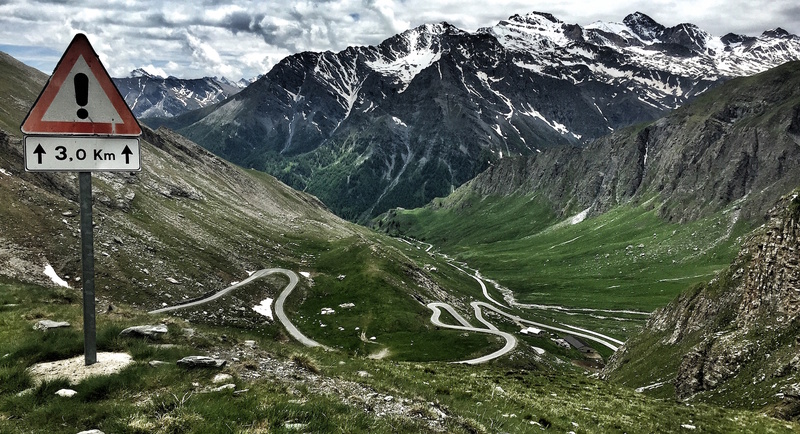 He described the natural loop formed by the cols of the Cayolle, Champs and Allos as one of the top three link ups on European roads and I’d been thinking about it for years. So far, our weather had been near perfect. In truth, it had actually been a touch too warm at times, but as someone who rides through a British winter each year, I’d told myself a long time ago never to complain when the sun shone. However, the temperature was rising by a few degrees each day and we were now into solid mid 30’s (in the shade) and well beyond that in the sun. Setting out from our start and finish point of Barcelonnette however, all seemed well and we rode together for the first 10km of the Cayolle. It’s a long climb at 30km and it quickly struck me how beautiful it was, rising first through a narrow gorge and then emerging into a beautiful Alpine valley. Tempted by photo opportunities, Kev and I were soon at the rear and leap-frogging each other up the valley as we stopped in turn to capture yet another stunning image. I therefore missed the attack by Tom, with Emma following his wheel for all but the last km or so. It seemed our Espoirs were in good shape. Riccardo coaxes Emma up the Champs. The upper section of the Cayolle was truly stunning and as I neared the top of the climb, surrounded by peaks, meadows, wild flowers and waterfalls, I realised that I had a problem: how to squeeze it into my ‘Top Five Best Ever Climbs’ when I already had twelve contenders! The summit was cool enough, but by the time we’d descended a thousand meters to the valley below, it was pretty warm again and over lunch, Tom asked me how heat stroke worked and whether you could ever drink too much when riding in temperatures as hot as the ones we were now experiencing. We talked it through and came to the conclusion that he should be drinking at least 750ml of fluids per hour and Riccardo contributed some ‘Salt Stik’ tablets to help. It was here that I made my only real mistake of the trip, in that I didn’t specifically have the same conversation with Emma and I failed to check exactly how much she was drinking. An hour and a half later, at the summit of the Champs, the answer became clear: not enough. Thankfully, Rich had shepherded her up the climb and despite feeling sick and pretty wobbly, she’d kept spinning her pedals. She arrived at the summit smiling, but Rich shot me a look which conveyed “she’s not smiling inside” and I immediately had a quick word with Allan. He’s something of an expert on cycling in the heat, living in the Middle East and riding right through their summer in temperatures nudging 50 degrees and beyond. He went straight into action with cold water and iced towels (as ever, Jimi was right on hand with the van) and although we lost some time, when we set out to descend, we were confident that Emma’s core temperature had dropped and impressively, she was still riding her bike, when others might have climbed in alongside Jimi at that point. The stats on our loop looked relatively innocuous: c.130km and 3,500m, but in the heat, this was not proving to be an easy ride at all. It’s also very remote and without Jimi, we’d really have struggled to acquire enough water to undertake it safely. The descent off the Champs is ‘technical’: be warned. The road surface was marginal for most of the way and in places, it almost disappeared completely. All credit then to Tom and Emma for navigating it without incident – their learning curve continued to be pretty much vertical! With Emma clearly in need of recovery and an easy finish, the route offered no such thing! 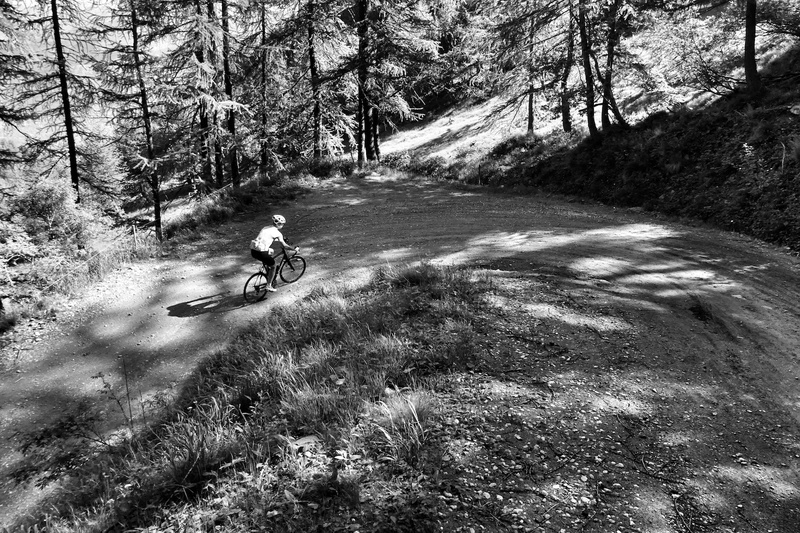 The 30km climb to the summit of the Allos was something of a drag, which she dealt with by riding ahead with Rich – it was a good tactic, as we’d all discover later. With the sun beginning to dip behind the mountains and the temperature finally falling, Tom and I waited for Allan and Kev to join us at the summit. We had a restaurant booked for 8.00 and nothing between us and that except a 20km descent: life seemed good. SGL & Tom basking in late afternoon sunshine, atop the Allos. However, rounding a bend at speed, I suddenly came across a line of stationary vehicles, stuck behind c.2,000 sheep! I’ve never seen so many sheep. They were being moved down the road for c.4km to new pastures by a combination of dogs and half a dozen shepherds! Jimi caught us up and we all agreed to just sit it out. The restaurant agreed to delay our booking and we alerted Emma and Rich that we were stuck – they’d been allowed to walk through, but we decided against trying to do the same. Houston, we have a problem! Several thousand problems in fact! Eventually the sheep turned off the road and we finished a stunning day, although not before I’d punctured and almost spun out on the very last and very fast, final corner. The margin between ‘all good’ and ‘all bad’ is often very narrow. Back in 2009, I rode the Route des Grandes Alpes from Geneva to Nice. It’s a brilliant route, full of stunning climbs, but one had really stuck in my mind and ever since, I’d always quoted it as the best climb I’d ever done. However, time dulls the memory and I’d ridden an awful lot of cols since 2009. Perhaps it wouldn’t live up to expectations? The Cime de la Bonette. 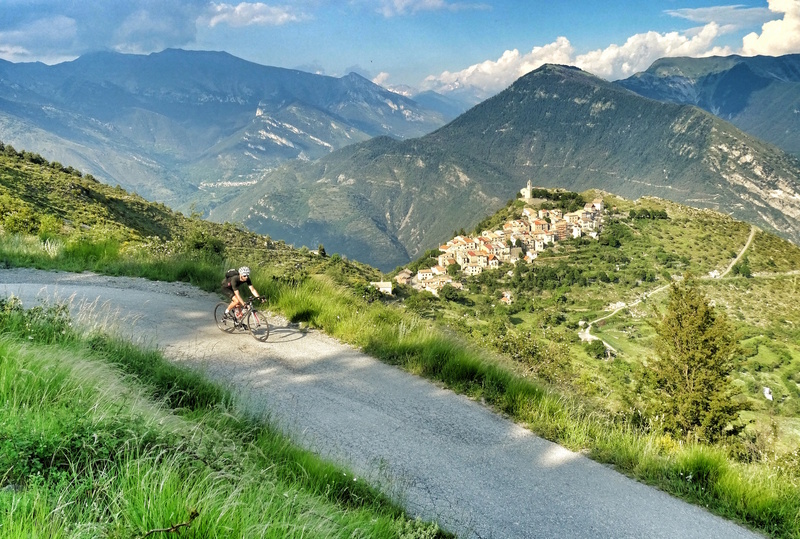 It had all the right ingredients: at 24km it was long enough to be meaningful, it was steep enough to be a proper climb and it ended at the highest paved road loop in Europe. 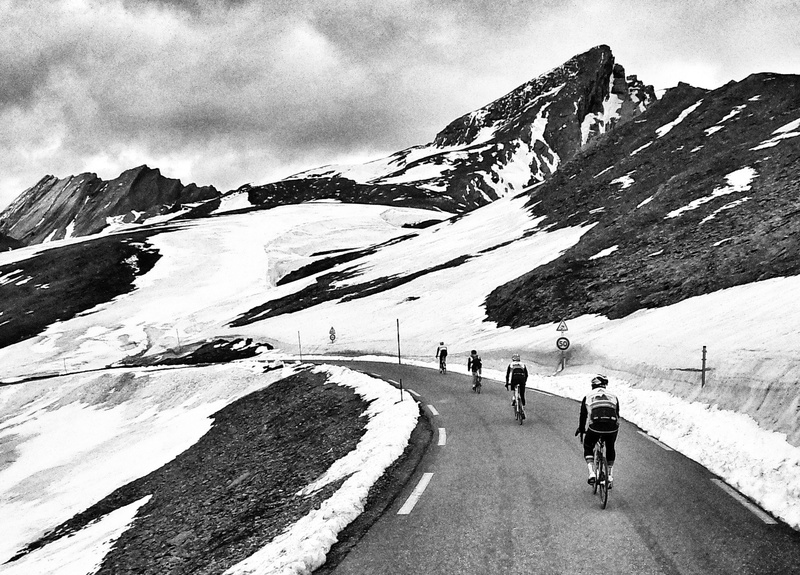 Over half of the climbing occurred above 2,000m. It was a proper climb in every sense. The bigger immediate question though was Emma, who arrived at breakfast looking pale. She’d clearly suffered from mild heat stroke the day before and was debating whether to ride or not. To her credit, she came back a few minutes later in her riding gear and we agreed to see how she felt after the 10km valley road to the bottom of the climb. Kev and Rich had left early, keen to add an extra loop that Jimi had prepared as an option, while the rest of us cruised to Jausiers, the town at the foot of the climb. The sky was a deep blue, there was very little wind and the temperature was rising. Tom set a wonderfully steady pace and Emma simply held his wheel. I yoyo’d my way up the climb, taking pictures and simply absorbing where I was. Tom & Emma heading up the Bonette. For a girl who had heat stroke less than 24 hours earlier, this is impressive! Just half way up, I knew that the Bonette was going to stay at the top of my list. It’s an amazing climb. Once again I was struck by the three distinct pieces of the climb: the hot lower slopes, leading up to and under a rock wall; then the Alpine meadows, opening up beautiful views ahead and finally, the upper mountain, devoid of vegetation. The scale and the altitude make a remarkable finale. 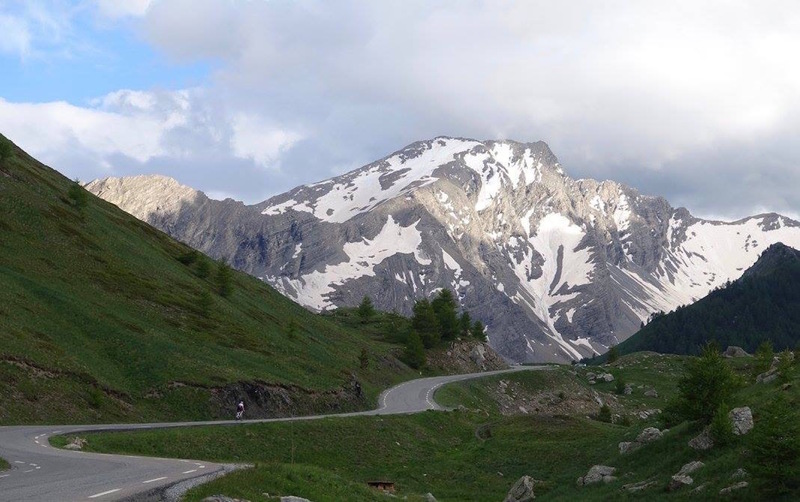 We regrouped at the Col and then headed up the 15% ramps of the loop road which take you to the Cime. It’s slightly contrived, but the snow banks made it worthwhile and being on top of the highest paved road pass in Europe with Tom, Emma and Allan was pretty special. Tom at 2,800m, dwarfed by a snow bank. The rest of the day was good, but inevitably, the Bonette had stolen the show. A steep summit finish woke us back up though and for Kev and Rich, 185km and 5,500m in, it was probably a painful finale! Riccardo & Kev discovering some amazing roads on another of Jimi’s ‘optional extensions’! 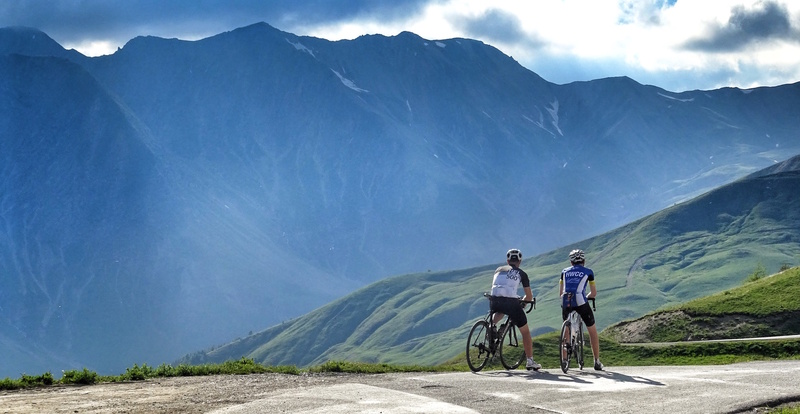 There was always a danger, since our previous days had covered climbs like the Finestre, the Agnello and the Bonette, that a trip like this would end too quietly. However, the Madone was yet another dream of mine: a legendary climb, made famous by the ‘Armstrong years’ and Trek naming a bike after it. By the time we rode onto the lower slopes, it was baking hot. But despite this, we clearly all had the same idea: last climb, full gas. Descending from the hotel on the final day. Our Espoirs now have this nailed and Tom leads us out. The pace was fast and I had to work hard to catch, only to then get dropped a couple of kms later. Kev seemed to have the jump on everyone, but gradually, Tom reeled him in, with a hilarious shout of “Kev, I’m coming for you” from 50m behind. Nice job team: from L to R: Kev, Riccardo, Allan, Emma, SGL and Tom. When you ride a route for the first time, you usually work out what you’d change to make it better next time. But in this instance, besides a different hotel on the fourth night, there was nothing to alter. This was undoubtedly one of the best trips I’ve ever ridden. The photos speak for themselves. I’m planning a return in 2017. It’s as simple as that. The Agnello: I know, you just want to be there, right now! Me too! P.S. Inspired by a glimpse into big rides and what’s possible if you set your mind to it, Emma went on to ‘Everest’ a climb in the UK in August. She’s the youngest woman in the world to do this – by six years! There’s an obvious problem with this list, I know: five does not equal thirteen! Besides that, the notable point is that five of these climbs were on this route. Quite simply, although this wasn’t the hardest ride I’ve done, it was certainly one of the best. It was a treat from start to finish: the stuff of dreams. 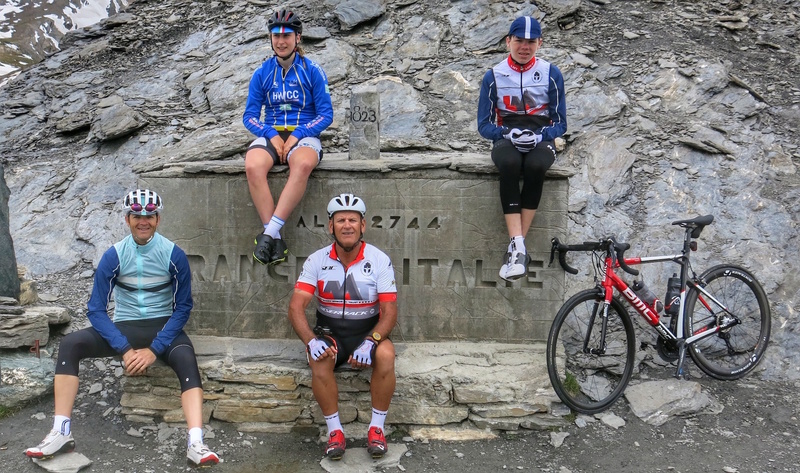 Thank you to Tom, Emma, Kev, Allan and Riccardo for sharing it with me and to Jimi Thomson of Two Tyred Tours ( www.twotyredtours.com ), for making rides like this possible. – an XTR Di2 rear dérailleur to accommodate that cassette! To get used to the gearing and also riding steep gradients all the time, I started running laps on a couple of steep local climbs: Kop Hill and Whiteleaf. Both reach 20% or more and sometimes I’d do alternate reps on both (they share the same summit (so would be perfect for a ‘Double Everesting’. Cough)) and other times I’d just pick one and do repeats. After a few weeks, I could ride them seated, keeping my heart rate below 140bpm (within Z3) and my power below 300 watts (330 FTP). So, I felt my body and my bike were ready for the Project H climb in Wales. However, there were two issues, one minor and one major. The minor one was that Kev (a friend, planning to ride Project H with me) and I didn’t really align on availability. I contemplated going alone and encouraged him to do the same, if the weather suddenly came good. There were about five potential dates, but we only coincided on three of them. The more significant issue was the weather. The UK ‘summer’ in July 2016 was basically governed by a southerly jet stream, leaving the south-east of the country dryish and the north and west, wet and windy. I started to get frustrated and worried the ‘Everesting season’ might slip away. It was with these thoughts in the back of my mind that I set out one Tuesday evening to run repeats on Whiteleaf. 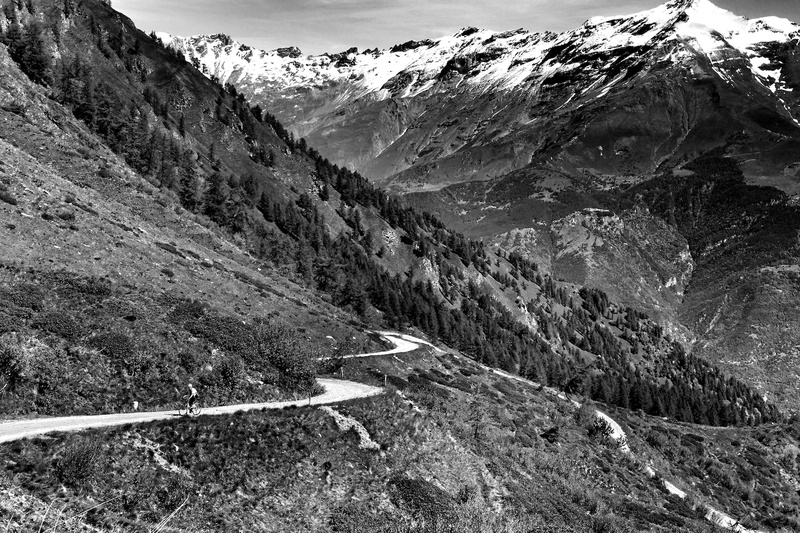 Number 23 in Simon Warren’s original 100 Greatest Climbs book, it’s 1.3km long and weighs in at a fraction under 10% average. It has three notable steep sections – the first at c.16%, the second, ‘the corner’ at c.25% and the third, a long, steepening ramp, nudging 20%. 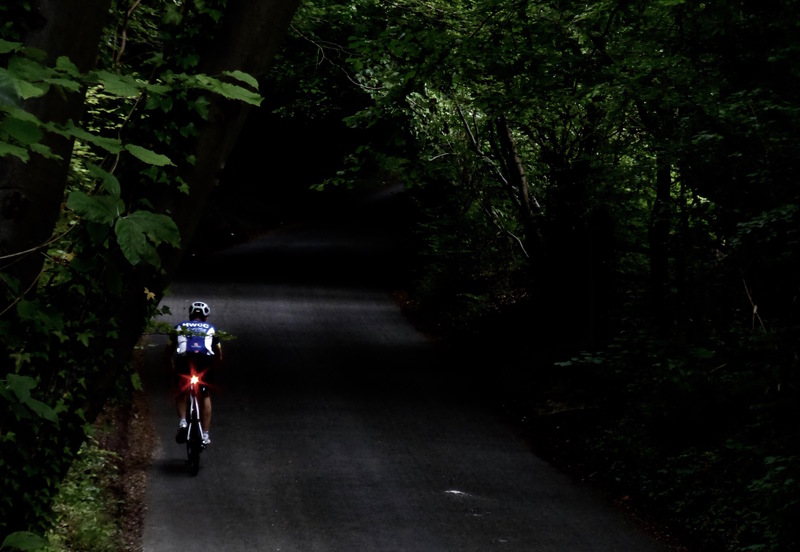 It’s a ‘proper’ climb, generally acknowledged as a contender for ‘hardest climb in the Chiltern Hills’ and it was used for decades as the centre piece of the Archer GP Road Race, as well as for local hill climb races. I ran eight laps that night and realised that I was still fresh at the end. When I got home, I checked the Everesting.cc Hall of Fame. No one had Everested Whiteleaf. I couldn’t quite believe it. 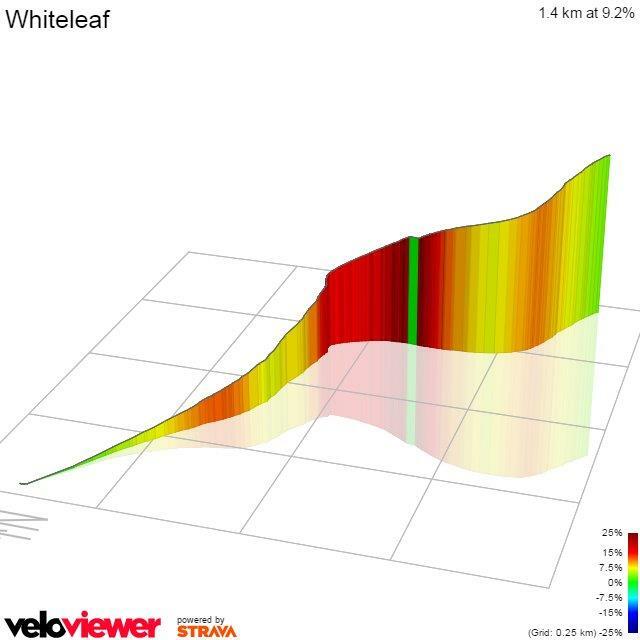 In local terms, this hill was iconic and most of the equivalent climbs close to London had already been Everested, some of them multiple times. Being the first to Everest a climb as good as Whiteleaf was a singular opportunity and I was now completely hooked. The following day, I checked the weather forecast again. It was still bad for Wales, but perfect for Whiteleaf. I decided it was karma and asked Kev whether he fancied joining me, but Whiteleaf held less allure for him versus the Project H climb. I locked in on my target, solo, and prepared a top tube sticker for Whiteleaf, breaking the climb down into sets of reps and correlating them to actual points on an ascent of Everest. I gathered my kit together, packed my car and took a big, deep breath. 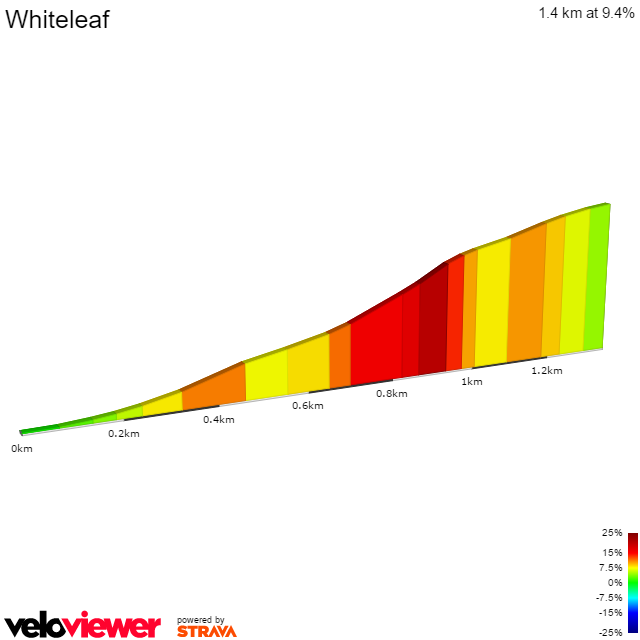 Everesting Whiteleaf would require me to ride 70 reps. The very last thing I did was download an audio book – Jon Krakauer’s ‘Into Thin Air’, a compelling account of the 1996 Everest disaster. I wasn’t sure whether I’d need the distraction or not, but I wanted the option. I posted a picture on Facebook of the packed car, to add a little motivational pressure (but without any details of the target climb) and went to bed at 9.30am on Friday evening, seriously nervous! My alarm went off at 2.00am. I dressed, ate breakfast and drove the four miles to the bottom of the climb, parking my car on the wide grass verge. I was riding my first rep by 3.00am, bang on schedule. It was dark, but my light cut a perfect beam and I settled into the task. My plan was to ride five reps at a time and then stop to refill my bottle and eat a little food. Allowing for that stop and a lap time of c12 minutes, each set of five reps would take c. one hour. That would mean a ride time of around 14 hours and I assumed I’d lose at least another three hours in cumulative stoppage time. You’ve almost certainly heard people talk about ‘the chimp on your shoulder’, particularly in the context of endurance challenges. I’m not sure who coined the phrase first, but British Cycling adviser Dr Stephen Peters has written a whole book on the topic: The Chimp Paradox. In very brief terms, it suggests that the rational part of your brain – the bit that says “I can do this”, is countered by the chimp: the irrational, emotional part that says “this is daft, let’s stop doing this”. Anyone who has ever run a marathon, attempted an Everesting, or a Cent Cols Challenge, or a Haute Route, will have had to overcome their chimp. They may well have spent days, even weeks, battling their chimp. BUT, here’s the good news: you can fool your chimp. He’s really not that smart – he’s all emotion, doubt and fear. For example, 70 reps of Whiteleaf and 14+ hours in the saddle sounded awful – my chimp would have the upper hand. But 14 sets of 5 reps, sounded completely different. Could I do another five reps, after each previous set? Yes, probably. My top-tube sticker was another way of fooling my chimp, by breaking the climb down into sections, rather than just aiming straight for the summit. It even included a message to him, at the very bottom: you only fail if you quit. In 2005, during a very long MTB ride, I even gave my chimp a name – he’s called Pete. I knew he’d show up at some point during the day. The other point I’d make here is that the more reference points you have to counter-argue your chimp with, the easier something like an Everesting gets. By reference points, I mean big rides: anything over 250km, or 10+hours in the saddle, or 6,000m+ of climbing. And crucially, any rides where you’ve had to battle your chimp and won. Where things get really interesting is when you go through a real physical problem – a pain, a lack of energy, heat, cold, ‘the wall’ or ‘a bonk’. It sometimes takes hours to ride out of a physical low point and your chimp will pounce on the opportunity, telling you to quit. I was fortunate in that I had a lot of ‘low point milestones’ and every year, I make a point of going looking for new ones in the early part of the season, to give me confidence for the biggest challenges in the months ahead. For anyone who doesn’t have many of these milestones (I call the milestones ‘Chimp Cheaters’), an Everesting will almost certainly, at some point, turn into a really tough experience. Three odd/funny things happened during the ride. The first was obvious even on the first lap: I couldn’t see them because it was pitch black, but the trees were full of squirrels! It was ‘hazelnut’ season and the squirrels were having a feast. From the steep corner upwards, the air was full of the sound of nut shells hitting the tarmac and three sections of the road were literally carpeted with nut shells! The first 10 reps went like clockwork and by 5.00am, I was 1,270m up Everest. Then, something really odd happened. As I neared the first steep section on the eleventh rep, it felt harder than it should have done. Looking down, I realised that my chain was on the big ring. But this was impossible, because I didn’t have a front dérailleur! We’d removed it, to keep the chain line clean, so I was effectively locked into my small chain ring. I climbed off, manually moved the chain back onto the small ring and carried on up the hill, pondering how that could have happened! I was lucky not to have torn the rear derailleur right off! My general advice for Everesting includes choosing a climb with a good, relaxing descent, where you can eat and drink and get a bit of rest. Whiteleaf is nothing like that: it’s steep, bumpy, technical and the bottom half has numerous driveways which could provide instant danger from cars joining the road. I was literally feathering the brakes almost the entire way down, hovering off the saddle. Even so, by 20 laps or so, I had the descent completely dialed-in and was hitting almost 80km/h. 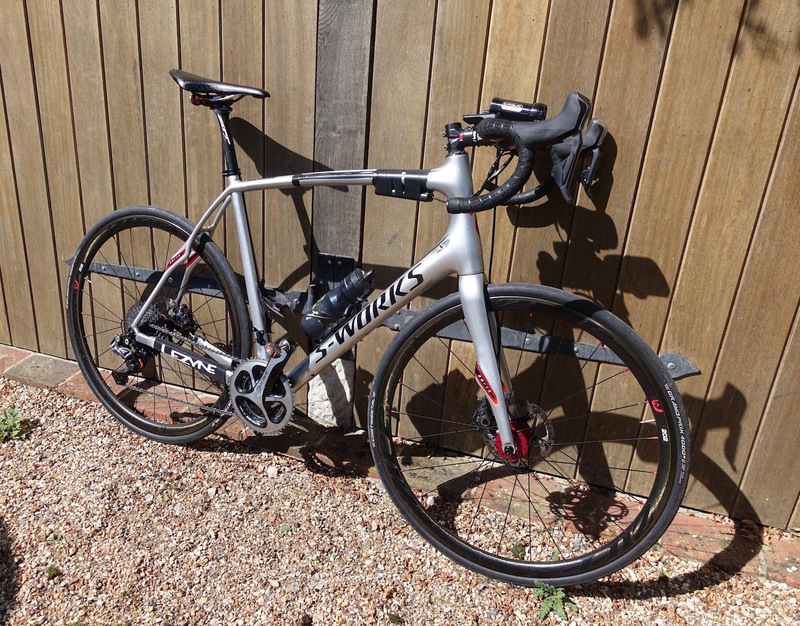 Disc brakes made a huge difference here – they were effortless and far safer. People always think about preparing their bike for going uphill, but I’d purposefully sacrificed a little bit of weight for the benefits of disc brakes because I knew they would help me get down safely – descending c.9,000m of 10 – 20% is not easy. By 7.00am and 20 reps in and I was still exactly on schedule. An occasional car came past and the sun had come up, but generally the road was quiet and it felt safe. I was ticking off the laps as I went, but had messed up my lap counter, so had to do it manually. I whiled away the climb by doing the maths in my head, checking total distance and height gained against my tally of reps, to make sure I was right. I was using two Garmins – a 1000 and a brand new 820. Amazingly, they never got further than 30m out of sync, which was remarkable given the scale of the overall ascent and even more so when Auto Pause kicked in two or three times on every ascent and descent, as the climb steepened under the trees and GPS struggled to keep a tab on me. 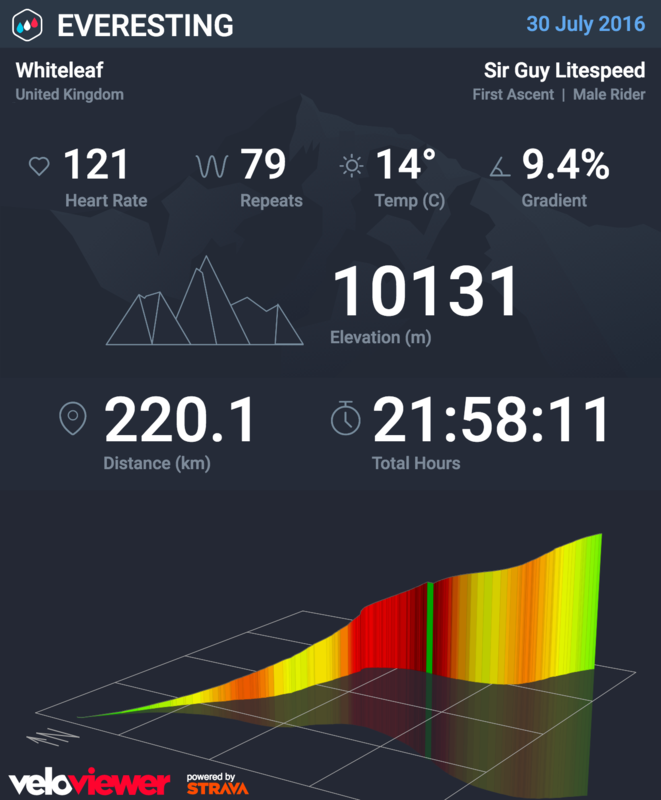 In line with my previous experiences of Everesting, my first and biggest mental goal was Base Camp, or 5,335m. This would require 42 reps of Whiteleaf and I had hoped to reach it around 1.00pm. I’d promised myself that if I reached Base Camp and felt OK, I would ‘go public’ on Facebook, thereby adding a little extra pressure and motivation. 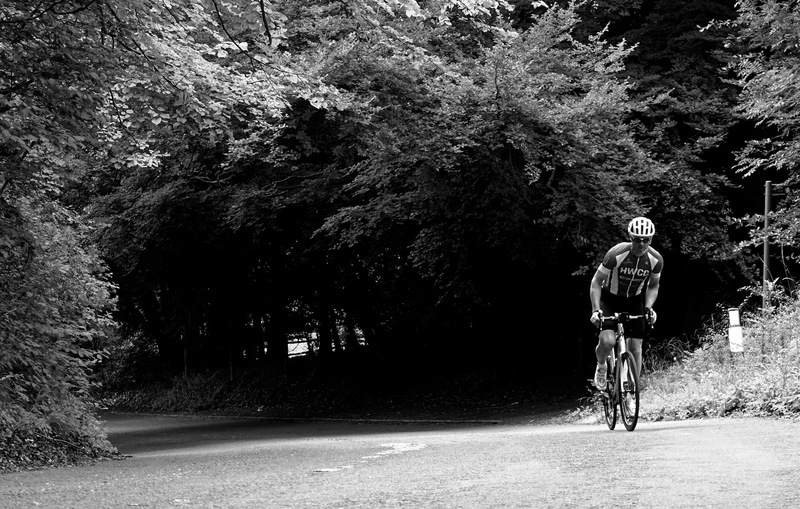 Up until this point, I’d told no one of my plans apart from my family, Kev and Ollie Blagden, one of the HWCC Espoirs who completed his own Everesting on a neighbouring climb the previous weekend. I decided that stating my plans publicly prior to my attempt was just setting myself up to look silly if I then failed. It seemed to me that it would be better to try, see how I got on and if I thought it seemed possible, then I would let people know what I was trying to do. 28 more reps didn’t seem too daunting (Pete didn’t completely agree), but I stuck to my plan of five rep blocks and just kept slowly climbing the hill. I’d pulled the trigger on the audio book on the eleventh rep and Jon Krakauer and I were nearing the South Col together. I’d read the book when it was first published, but had forgotten most of the detail and it was proving really interesting and apt. I’d pause it at the start of each descent and then start it again when I turned at the bottom. In this case, with heavy modifications, a lot of it was All About The Bike! The next milestone was 57 reps (7,200m and Camp 3 on Everest) and by then, I was starting to have to really work at it. My heart rate had climbed from a max of sub 140bpm, to early 150s, but now it was falling again, a sure sign that my muscles were beginning to lose power. Interestingly, my coach had been testing my muscle glycogen storage in the days leading up to the ride and we’d discovered two things: I could recover to full storage in less than 12 hours after a training session, but just 24 hours before starting the attempt, I inexplicably appeared quite depleted. I largely ignored this – I felt strong and went ahead anyway. 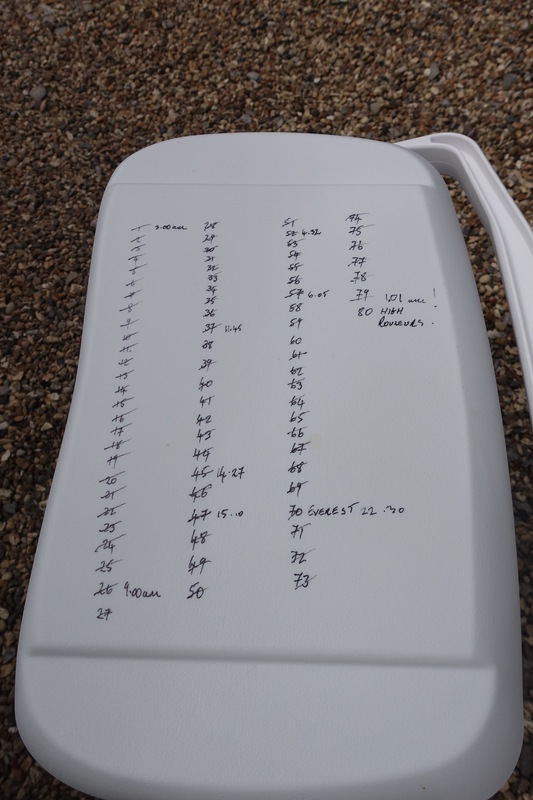 It was later explained that I appeared to be storing the glycogen in a thin layer of fat on the surface of my muscles, rather than within my muscles – useful for an Everesting, but less helpful if I’d been riding a 25 mile TT! Having messed up the settings in my Garmin’s lap counter, this was the solution – a pen and the lid of my cool box! So I wasn’t finished, even though mentally, all I wanted to do was pack up and drive home. This was undoubtedly the toughest single moment of the entire ride – Pete (my chimp) was jumping up and down on my shoulder screaming “oh come on, you have to be kidding! Let’s just go home! It’s past 10.00pm and we should stop this nonsense right now”. However, it’s not often anyone gets this close to riding 10,000m in a single ride and I didn’t want to pass up on the opportunity – I knew I’d always regret it if I did. I told Pete to simmer down and also decided to skip further stops and just kept going, riding the final 13 laps in one go! The last two felt really, really difficult and my lap times were nudging 14 minutes by this stage (my ascent times spanned 8’41” to 11’44” on the final one – three minutes slower than at the start)! I’d been in the saddle for just under 16 hours and on the road for about 22. Where I lost 6 hours I have no idea – I ate proper food four times and paused to recharge my Garmins in the car a few times, but even so, I still couldn’t work out the elapsed time (loss)! 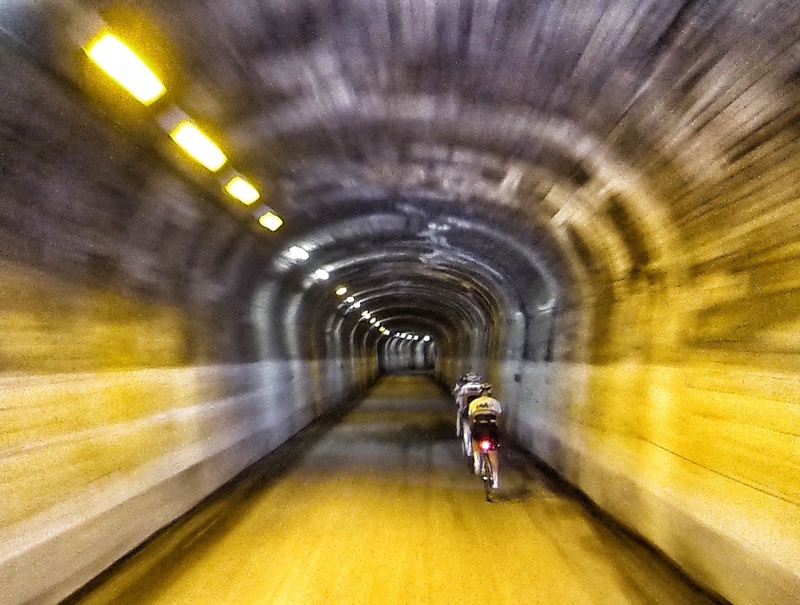 But it didn’t matter – an Everesting isn’t about time, it’s simply about doing it. Even better, I’d managed to carry on to ‘The Limit’ and complete 10,260m of ascent in a single ride. I headed home feeling wasted, but happy, where I uploaded my ride and was able to confirm that I had definitely ridden 80 laps. I breathed a sigh of relief. I went to bed at 2.30am and woke up five hours later in exactly the same position – I literally hadn’t moved at all. I was tired after this ride – tired enough to notice the impact even a couple of weeks later – but perhaps less so compared to the aftermath of my first Everesting. My toes weren’t numb this time and when I rode the bike again 24 hours later, I felt OK. It had been a tough ride, but not desperate and almost certainly not my hardest ever. I know from previous experience that it’s possible to suffer a complete, ride-ending physical melt-down, but they’re not common and that risk aside, I think for me and for most cyclists with the appropriate milestones, an Everesting is really a mental challenge, more than a physical one. Predictably, my mind has turned to ‘what next’ and ‘soil’ and ‘significant’ are likely to be key ingredients. Stay tuned. Sir Guy Litespeed, August 2016. ** When I got home, I was reminded of Tejvan Pettinger’s quote from his blog www.cyclinguphill.com – in 2014, he said: “I really wouldn’t fancy everesting Whiteleaf because it is too steep. You get the vertical height gain over with in a short distance, but it is too intense on your muscles. To Everest, you are looking at 12 – 16 hours in the saddle. You have to be comfortable.” I think at the pace Tejvan was going, this is a fair comment! My gears helped hugely.